The glistening steel surface of the Teppanyaki counter is a stage waiting for the play to begin. Behind it, the larger-than-life calligraphy on the walls is a ready-made set design, against which the lead actors will perform the play. We are at India Jones, Trident, Nariman Point, Mumbai. It is a bright summer’s day, with pre-monsoon clouds starting to make an appearance on the horizon outside. Inside, chaos reigns. But it is an organised chaos, one that will soon resolve itself into the perfect setting. Once the photographer with his trailing wires hooked to the computer monitor and the umbrellas masking the flash lights have been positioned, we wait for that perfect shot. “Chef, put that toque on please”, requests Kanan Udeshi, of The Oberoi to the hotel’s executive chef Joy Bhattacharya, a soft-spoken maestro with a determined jaw line, whose culinary and managerial skills are worth experiencing. I have been staring bemusedly at the two pink-grey slabs of meat in front of me. Thinking about how fattened liver has created such vociferous dissensions, such howls of protest in the culinary world across the globe. Chef Xianchun Meng is looking equally bewildered by the bustle around him. A new recruit from China, his English is apparently not as brilliant as are his culinary skills. He is the restaurant’s dim sum chef, particularly fond of gulab jamun and about to kick up a mouth-watering foie gras dim sum. Excited for another reason altogether is the other lead player. Chef Emanuele Lattenzi, executive Italian chef at Vetro (The Oberoi), has succeeded where everyone before him had failed – in educating the Indian palate on the delights of authentic Italian cuisine, the real mama mia! Emanuele will be cooking a foie gras dish, Continental style, assumably with a good deal of experience in famed UK restaurants like Stefano Cavallini and Ibia as well as at the renowned Hotel Hassler in Rome. Our Roman maestro however looks a tad bit lost, as we discover that wife Lea is in Rome, due with their first child, expected any time soon, while he is here, chopping up the condiments that will accompany his pan-fried foie gras. 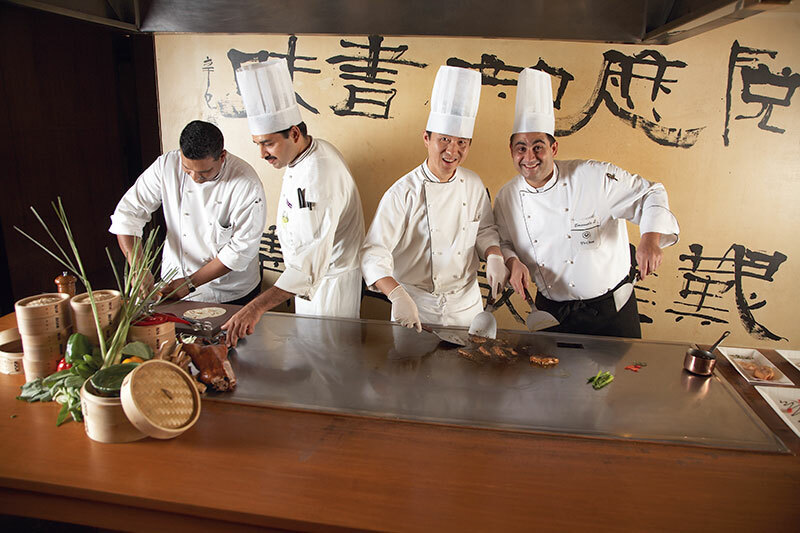 Joy’s chuckling like Mother Goose, chef Amit Gugnani hovers in the background, Xianchun reaches out to touch the hot Teppanyaki grill and before I can yell, “Don’t!” I find that the joke is on me. He’s reaching out to break an egg. It sizzles, scrambles and is shoved aside, its readiness giving the signal that our maestros can now use the grill that’s just hot enough. Instead, I turn my attention to the chefs and each one’s individual style of cooking. How often have we eaten in the world’s haute dining spots and how rare it is to witness the actual process that goes behind making that one delectable, finger-licking dish? Emanuele’s hands are rolling the gnocchi. Into each oval ball, he stuffs the creamy foie gras, as gently as one would feed a baby. Joy meanwhile has brought out the roast duck, already cooked in the traditional Peking style. Chef Meng starts kneading the dough and then rolling each portion into a circle for the pancakes, in much the same manner as you would to make crepes. And lo behold! In a matter of minutes, before me appear not one, but two mouth-watering foie gras dishes. Ingredients: Goose liver, 100gm; Salt, 10gm; Pepper, 5gm; Potato, 100 gm; Refined flour, 25gm; Egg,1 no. ; Butter, 20gm; Spinach, 150gm; Balsamic reduction, 10gm; Duck jus, 50ml. Method: Put salt and pepper on liver and pan sear it on a hot pan. Boil the potato and make dough with flour, salt, and egg. Make the gnocchi by stuffing the creamed goose liver inside. Blanch the gnocchi and toss in butter. Drizzle balsamic reduction on the plate and place the gnocchi and wilted spinach. Put the cooked pan-seared liver on top of the spinach. Finish with truffle oil. Serve with duck jus on the side. One of the world’s great luxury foods, foie gras (literally, ‘fattened liver’) is the liver of either duck or goose. Goose, which is considered to be more flavourful and to have the finer texture, is more expensive. 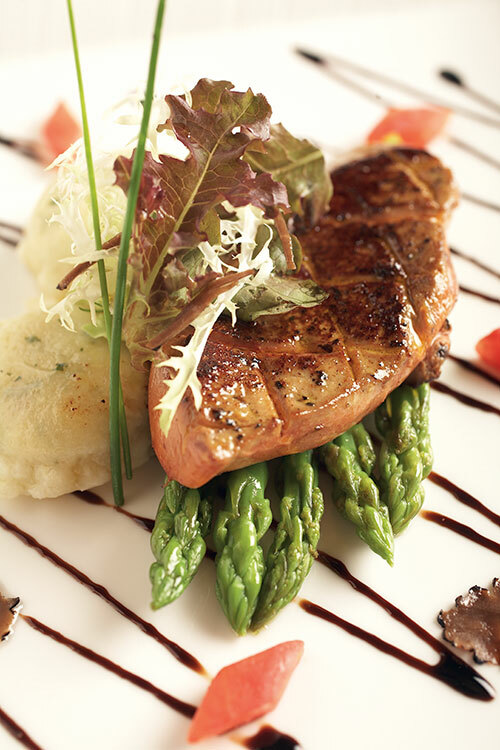 The Egyptians discovered foie gras around 2500 BC. But it is the French who contributed to the popularity of foie gras with their different ways of cooking it: foie gras torchon style, bloc of foie gras and mousse of foie gras are recipes that have been developed by great French chefs. Banned in the UK (because of the method of force-feeding geese to engorge their livers), foie gras production is most associated with Gascony, in south west France, but Hungary is also a big producer. Despite the controversy surrounding foie gras, its creamy, silky texture and unique flavour, quite unlike any other liver, means that it remains a sought-after ingredient. It can be bought whole and raw (known as lobes), semi-cooked (micuit) or cooked in paté, block or mousse. The good news is that a Spaniard, Eduardo Sousa, has found a method of naturally feeding the geese with the same exceptional flavour and results. Ingredients: Duck whole, 1 no. (2 – 2.5 kgs); Pâté de foie gras, 100 gms. For the stuffing: Spice mixture: Five spice powder, 30 gms; Salt, 10 gms; Sugar, 10 gms. For the aromatic vegetables: Lightly crushed ginger, 20 gms; Whole spring onion, 3 nos. For the glaze: Water, 450 ml; Rice vinegar, 15 ml; Maltose, 15 gms; Salt, 15 gms. For the pancakes: Refined wheat flour, 350 gms; A pinch of salt; Water, 250 ml; A dash of sesame oil. Accompaniments: Prawn crackers (krupuk), 6 – 8 nos; Cucumber, peeled, deseeded and shredded, 1 no. ; Shredded spring onions, white bulb only, 6-8 nos; Hoisin sauce, 3 tbsp; Plum sauce, 3 tbsp. Method: Clean and rinse the duck and pat dry thoroughly with paper towels. 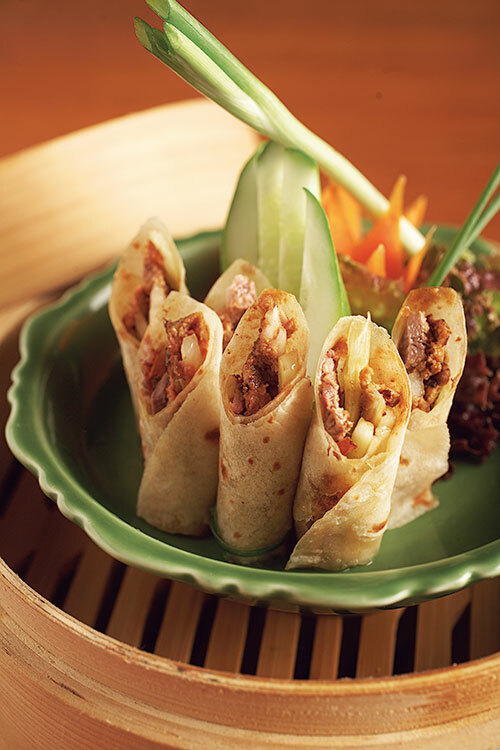 Combine the Chinese five spice mixture, in a bowl and rub the mixture inside the cavity of the duck. Stuff the cavity with the aromatic vegetables and seal with a skewer. To make the skin crisp, insert a bicycle pump in the neck hole and pump until the skin is taut. To prepare the glaze: Combine above ingredients in a bowl and place the same over a hot water bath for the maltose to liquidise. Insert the specially designed hook under the wings, pass the neck through the ring and hang the duck. Boil approximately 2 litres of water in a wok, add little salt. Once the water starts boiling, wash the duck by holding it over the boiling water and pour the water ladle by ladle over it (approx. 5 – 6 ladles). Hold the duck over the glaze bowl and ladle the glaze over the duck. Allow the duck to dry under a fan till the skin completely dries. Preheat oven to 2000˚c. and place a tray half filled with water to collect the drip. Once dried, hang the duck on the rod inside the oven and reduce the temperature to 1500˚c roast for at least an hour until the skin is crisp. To prepare the pancake: Combine refined flour with salt, add water and oil. Knead into smooth dough. Rest for 30 minutes. Dust a surface with flour; divide the dough into two and knead individually. Roll each portion into a log and divide into 12 dumplings. Roll each to create a six inches circle. Heat a frying pan. On low heat place the pancakes and cook until brown spots begin to appear. Flip and cook for a further 10 seconds. To serve: Transfer duck to a platter, place together with cucumber, spring onions and pancakes, pan sear and shred pâté de foie gras, carve off the skin and place on crisp fried prawn crackers. Top with a little plum or Hoisin sauce or both. Roll up and eat.